Pop hits the Big Time... he's now "..as seen on The Willard Scott Show "! 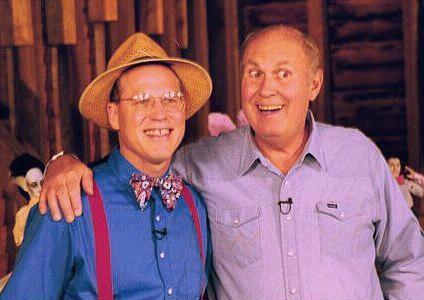 Pop Culture (known as "Mark Daughtrey" in Lexington, Virginia) was featured on an episode of Willard Scott�s Home and Garden Almanac on Thursday, January 21st. The show is broadcast nationwide on the Home and Garden channel. Pop was the episode's featured guest during the "Behind the Barn Door" segment of Scott�s program. Pop, who taped the show in June of 1998 at Scott�s farm in Augusta County, Virginia, displayed and talked about some of his favorite pop culture collectibles. Since 1997, Pop has owned and operated a "cyber-store" known as the The Pop Culture Store, which deals in various toys and collectibles inspired by popular culture. "There really isn�t any storefront or showroom," Pop said, "because it�s all located on the Internet. I play the part of kindly old Pop Culture, the proprietor. When the web site comes up on the screen, the first thing you see is a picture of me in my �Pop� outfit, welcoming folks to the store. I run the business out of my home, and all of my sales are mail order. We even have secure on-line credit card ordering." Besides his store out on the Information Superhighway, Pop also operates a mobile DJ service and performs as a semi-professional magician in the Rockbridge County area in the Shenandoah Valley of Virginia. 'Pop' gives a lot of credit for the store�s existence to his good friends and web masters, Jim Salmons and Timlynn Babitsky of Raleigh, North Carolina. "I couldn�t have done it without them," Pop noted, " because I�m still a relative beginner when it comes to computers. I know about collectible toys and they know about computers, so we put our heads together and came up with the store." Pop and Salmons were college roommates at Washington and Lee University, in Lexington, during the early 1970�s. "I�ve already gotten orders from all over the world," said Pop. "So far, I�ve sent out toys to Japan, Canada, Australia and all over the United States. The internet is a great way to meet other interested collectors world-wide and you never have to leave home to do it!" Pop�s presence on the internet is what brought him to the attention of the producers of the Willard Scott show. "It was really a shock," he said. "One day last April, I got a call from a producer in Los Angeles who said that she had seen my site on the web and thought that I would make a good guest for the "Behind the Barn Door" segment on Willard�s show. I thought that she might be pulling my leg at first. A couple of weeks later, I received a confirmation in the mail and realized that everything was on the level. I think it�s a great opportunity to promote the store and I only had to drive about 25 miles to get on a national television show. What a country!"